Take a 2 1/2 hour sightseeing bus tour of Madrid and discover the most important buildings, avenues and squares, ending with an entrance to the Wax Museum. You will see locations such as the Gran Vía, Plaza de España, University, Moncloa, Calle Mayor, Puerta del Sol, Puerta de Alcalá, the bullring and Columbus square. Ending with an entrance to the Museo Reina Sofia. Make the best of your stay! 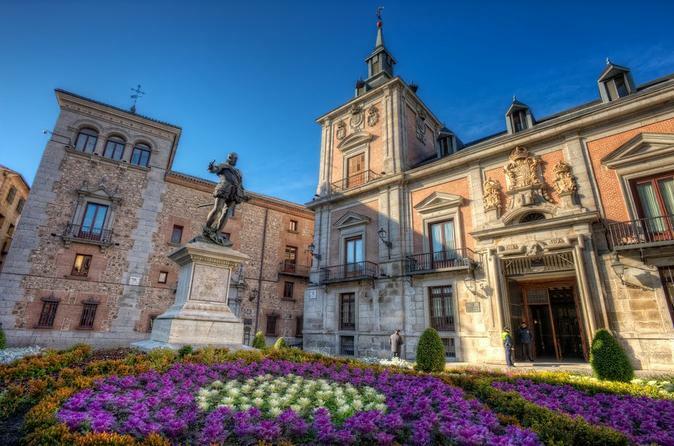 Discover Madrid on this 2.5-hour sightseeing tour, get to know the main monuments and their history, from the old Habsburg and Bourbons quarters to the present modern city. During this tour, you will see places such as the Gran Vía, Plaza de España, University, Moncloa, Calle Mayor, Puerta del Sol, Puerta de Alcalá, the bullring, and Columbus square. Continue along the Paseo de la Castellana and the Real Madrid stadium Santiago Bernabéu, Plaza Castilla, fountain of Cibeles. Once the sightseeing bus tour is over you will be transferred to Museo Reina Sofia for an unforgettable museum experience. The museum is mainly dedicated to Spanish art. The highlights include excellent collections of Spain's two greatest 20th century masters, Pablo Picasso and Salvador Dalí. Certainly, the most famous masterpiece in the museum is Picasso's painting Guernica. The Reina Sofía collection has works by artists such as Juan Gris, Joan Miró, Julio González, Eduardo Chillida, Antoni Tàpies, Pablo Gargallo, Pablo Serrano, Lucio Muñoz, Luis Gordillo, Jorge Oteiza, and José Gutiérrez Solana. Along with its extensive collection, the museum offers a mixture of national and international temporary exhibitions in its many galleries. It also hosts a free-access library specializing in art, with a collection of over 100,000 books, over 3,500 sound recordings, and almost 1,000 videos.